The ability at the molecular level to keep track of time is a property shared by organisms ranging from the simplest unicells to humans. The primary feature of these biological clocks is their ability to entrain to environmental stimuli. The dominant stimulus comes from environmental light cues, which requires the existence of photopigments sensitive to light. The exact identity of the molecules involved in circadian photoreception has remained elusive. The classical view of the circadian system is of diverse physiological rhythms regulated by a centralized clock structure. This book presents evidence that challenges this view. Experiments in both vertebrate and invertebrate systems demonstrate that the circadian timing system is dispersed throughout the animal and suggest that possibly every cell contains an autonomous clock mechanism. A variety of tissues and cells contain have been shown to maintain an oscillation when placed in vitro and removed from any external cues or signals that originate from the classical clock structures and/or the environment. This book draws together contributions from an international and interdisciplinary group of experts whose work is focused on all aspects of the topic. 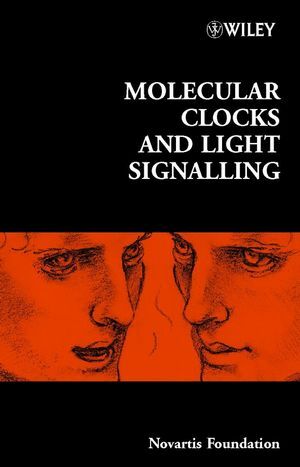 Coverage includes the mechanisms of light signalling to the vertebrate clock, the connections between central and peripheral clocks, circadian gene expression patterns and output pathways of clock mechanisms. Derek J. Chadwick and Jamie A. Goode are editors for Molecular Clocks and Light Signalling and other scientific titles. Non-rod, non-cone photoreception in rodents and teleost fish (R. Foster, et al.). Cryptochromes and inner retinal non-visual irradiance detection (R. Van Gelder and A. Sancar). Light signalling in Cryptochrome-deficient mice (X. Bonnefont, et al.). Circadian light input in plants, flies and mammals (S. Panda, et al.). Orphan nuclear receptors, molecular clockwork and the entrainment of peripheral oscillators (N. Preitner, et al.). SCN: ringmaster of the circadian circus or conductor of the circadian orchestra? (A. Davidson, et al.). On the communication pathways between the central pacemaker and peripheral oscillators (N. Cermakian, et al.). Central and peripheral circadian oscialltors in Drosophila (P. Hardin, et al.). Integration of molecular rhythms in mammalian circadian system (H. Okamura). Circadian transcriptional output in the SCN and liver of the mouse (J. Hogenesch, et al.). The molecular workings of the Neurospora biological clock (A. Froehlich, et al.). Expression of the clock gene products in the suprachiasmatic nucleus in relation to circadian behaviour (M. Hastings, et al.). Circadian rhythms in Drosophila (M. Rosbash, et al.). The role of phosphorylation and degradation of hPer proteins oscillation in normal human fibroblasts (K. Miyazaki, et al.). Regulation of daily locomotor activity and sleep by hypothalamic EGF receptor signalling (A. Kramer, et al.). CK1 and GSK-3 in the Drosophila and mammalian circadian clock (E. Harms, et al. ).